You are here: Home / Jyotish Gemstones and Talismans / Celebrating 25 years of Love and togetherness with Diamonds, Emeralds and more! Celebrating 25 years of Love and togetherness with Diamonds, Emeralds and more! Special occasions such as these make us feel very special. Diamonds spell romance, Emeralds stand for eternal love and gold stands for a life of fulfilment. This special couple have all these more. Long standing patrons of Gemstoneuniverse celebrated their 25th Wedding anniversary in a novel way by exchanging the marriage vows once again. 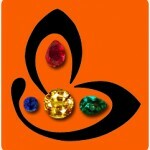 Combining Vedic gem therapy with a special occasion to not only celebrate love but also to optimise life! They wanted to commemorate their Silver wedding anniversary in a unique manner through jewelry, but jewelry that would not only be for vanity but also that stands for their everlasting love. Even though we at Gemstoneuniverse.com are not big on Diamonds, and Diamonds were what the Patrons requested, we went out of the way and procured these wonderful and flawless Diamonds for them and created these masterpieces fit for the special occasion. To see the joy and satisfaction on the faces of this wonderful couple is the best reward that we at Gemstoneuniverse.com strive for! The very purpose of Gem therapy is to optimise life, and we being committed to Gem therapy get the most satisfaction when we see people benefit, both tangibly and intangibly! In this case the idea of commemorative purpose coupled with gem therapy of the Patrons left us speechless and deeply touched! We are indeed honoured to be a part of the Patrons’ celebration, and also in deep gratitude to them for putting so much faith in us! Men’s Signet Ring: A Diamond signet ring is finger ring that contains a signet, often in the form of an initial or a monogram. 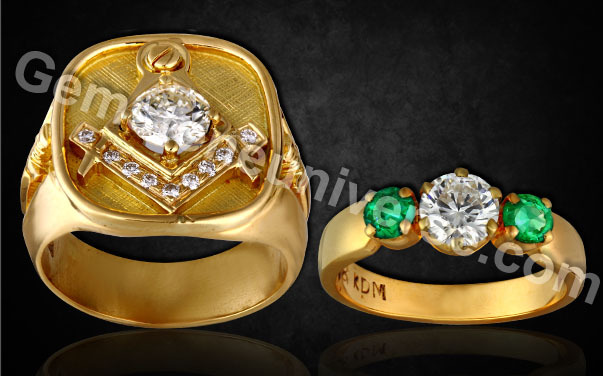 This is a classic Masonic Cigar Band Signet ring engraved with a square and compass and the centrepiece being a wonderful Diamond representing the all Seeing Eye, and also the planetary energy of the planet Venus that is also the most beneficial planet of the patron. Women’s spectacular 3 gem ring: Often used as an engagement ring, and also sometimes a significance of the Yesterday – Today – Tomorrow concept, this fabulous creation is also representing the beautiful past of the couple, the bright glorious present and the fertile future. And the beauty in this ring lies not only in the concept of the ring but also the use of the gems that are of the planets that are also the most beneficial for the patron, in this case the Natural Colombian Emeralds representing Mercury and the Natural Diamond representing the planet Venus! Super deep green finest Colombian emerald accentuates the beauty of the Diamond even more. So true. Honesty and everything recognzeid.